Ambrose, Ziggler, Dreamer, Alberto, Paige, SD Rating, Fish, O'Reilly, Women's Rumble, Cody, Ospreay, Mayweather - Thurs. Wed. #2 is HERE. Please follow us on Tumblr or Twitter, subscribe to us on YouTube or like us on Facebook. Don't miss Thursday Night AMP taping at 9 PM ET! With the cheap plugs out of the way here's Thursday's latest news! 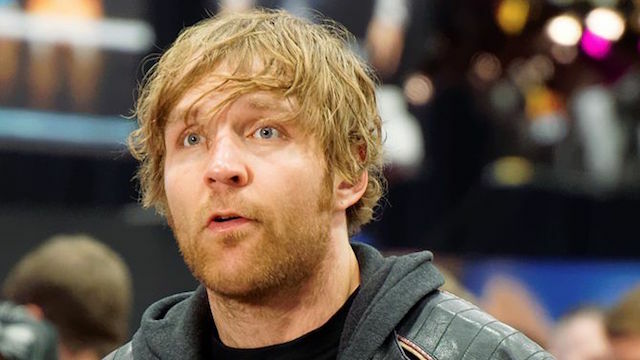 Good news for WWE fans -- Dean Ambrose's triceps tendon surgery was a success. The bad news is he'll be out for an extended period of time. Sayeth WWE: "Dean Ambrose underwent successful surgery Tuesday night to repair a high-grade triceps tendon injury, WWE can confirm. The procedure was performed by Dr. Jeffrey Dugas in Birmingham, Ala., and took around 40 minutes. 'He tore some of the distal triceps tendon where it attaches to the forearm bone, called the olecranon,' Dr. Dugas told WWE.com. 'He basically tore about 50 percent of the triceps tendon away from the bone. So yesterday we repaired that back down to the bone where it tore off of. The surgery was very straightforward; we removed all of the extra bursal tissue - all of that extra swollen stuff around his elbow.' Dugas added that Ambrose has begun physical therapy, starting with light range-of-motion exercises, and is expecting to leave Birmingham later today. It is unknown at this time how long Ambrose will be out of action." Due to Dean's injury and surgery the December 26th MSG card has been revised. In this interview Tommy Dreamer says the original ECW would have died no matter what: "I did think it was going to survive, there were opportunities for it to survive. The biggest thing is none of us knew that Paul was in Vince's pocket the whole time, so it couldn't have survived because of that." Here Alberto El Patron talks about breaking up with Paige: "By now everyone knows we are not together. We decided to end our relationship because I am in San Antonio, she is in Orlando, and now she is back on the road, and you know the schedule on the road there is non-stop, and my schedule is also non-stop. My projects with Telemundo and TV Azteca, calendar, clothing line, charity events, and all that stuff, we just weren't seeing each other. With her training to come back they were not allowing her to come to San Antonio I couldn't go to Orlando because II have three little kids, and I was coming home 2-3 days. I had to choose between going to Orlando for that time or staying with my kids and of course I chose to stay with my kids, so we decided to end our relationship. I know people just found out or they are just finding out, and the ones are just finding out, it was days or few weeks ago. We ended the relationship weeks ago, but we both agreed not to say anything because we got tired of the media, people, everyone just having an opinion about us, including family who had an opinion on our relationship with what we did." Twelve new WWE related videos are below including WWE NXT highlights with Bobby Fish & Kyle O'Reilly of The Undisputed Era winning the tag titles! A new Kenny Omega vs. Chris Jericho t-shirt is also now up for sale. To ESPN's way of thinking (and I don't disagree) Rusev is one of the most underutilized WWE wrestlers of 2017: "Hey, remember when Rusev rode a tank into WrestleMania? Remember when he was completely dominant and the ultimate heel? Remember when his persona was so brutal that boos rang through every arena, every night? Ahhh, good times. Unfortunately, at this very moment, it's far from Rusev Day. While a new push may have just begun as part of his strange pairing with Aiden English, Rusev's 2017 has been mostly forgettable. His match against Randy Orton at SummerSlam didn't even quality for a popcorn break as it lasted all of a few seconds, and his Flag Match at Battleground against John Cenasimply didn't deliver after a long, plodding journey to an inevitable end. The WWE has an elite talent who has proven he has the charisma to make any segment great. The accolade is a brutal finisher and Rusev needs to get back to being the angry superstar that brought him to glory. Now please Rusev, go machka something." In this interview Brandi Rhodes talks about how she got on WAGS Atlanta: "Getting cast was very bizarre because I had been working on another project in the reality realm I guess, and hat had taken 6-8 months in the process of production and trying to figure out our deal. At the tail end of that, I get a call saying 'hey, these folks from WAGS Atlanta want to do a Skype interview' which is the beginning (in my opinion), so I'm like 'sure! why not? No problem' We do the Skype interview, I forget all about it. A week later, there's a contract in my mailbox. So, unbeknownst to me, they had finished casting, and they had needed one more to wrap the whole cast up, and it ended up being me." Here John Cena explains why he learned Mandarin: "I started wanting to learn Mandarin to get our global company to be a true global company. I'm fascinated with the language and have become obsessed with trying to learn it. I don't have a lot of free time, but when I do, for an hour or two of my day, a tutor comes over and we just talk. I have a Ziploc bag with two huge stacks of flashcards - and each stack used to take me about an hour and a half to go through and now it takes me 30 minutes. So, on the days when I want to just cruise through Instagram, I have to tell myself that would be fun, but do it after half an hour's worth of cards." Matt Hardy's trademark on "Broken Matt Hardy," Billy Corgan's trademark on "NWA" and WWE's trademark on "He Hate Me" have all entered the "opposition phase" where people can file to dispute the mark. (PWI) Given Rod Smart was just interviewed about his time in XFL and working with Vince McMahon today I'd fully expect him to oppose. Impact has already said they won't oppose Broken Matt Hardy, but NWA is anybody's guess who could oppose it. If either Northwest Airlines or N----z Wit Attitudes were still in business, they probably would, but they're both long defunct. Well we can forget about Floyd Mayweather Jr. going to UFC because he just shot that idea down: "I never said I was going to fight in the UFC. I didn't say that. I just said if I wanted to and what I could do. 'Would' and 'could' do isn't the same thing. I'm not going to do it, though."